We're hoping to make this years annual beer festival better than ever before, so we have been working hard to select the BEST beer that Scotland, the UK and the world has to offer! This year is the 34th year since the festivals first inception, the dates this year fall on the 21st and 22nd of March, which happens to be world water day! Because of this we thought it appropriate to hold the event in support of Water Aid, a fantastic charity focussing on providing clean water and good sanitation to those who need it most around the world. 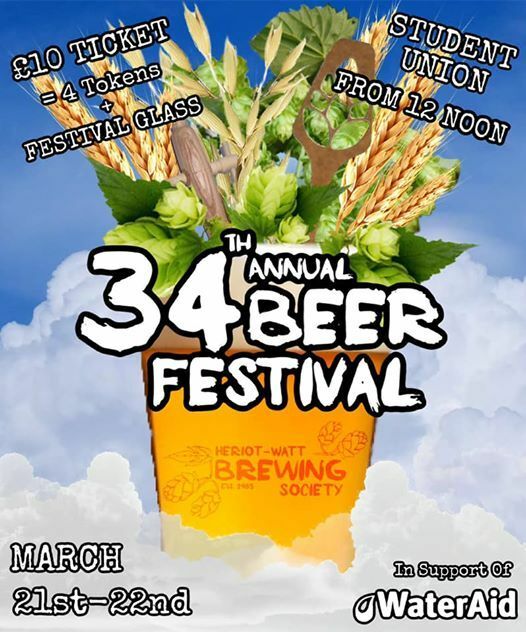 Please join us on the 21st and 22nd of March in Zeros, Heriot-Watt Student Union, where we will be pouring some cracking beers and ciders in support of a fantastic charity. 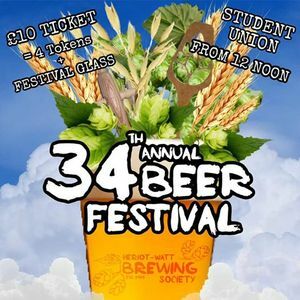 Tickets cost £10 and are available on the day to students and non-students alike. The ticket covers the cost of four beer tokens, and your festival glass (your ticket for both festival dates). Extra Tokens will be available throughout the festival for £1.50 each.